ADMISSION: The gallery is free and open to the public - Tuesday - Thursday, 12-6pm, Friday - Saturday, 12-5pm, and by appointment. There is street parking and the Parking Garage across the street from the gallery will be OPEN LATE (until 10pm) the night of the OPENING. Jordan Faye Contemporary is thrilled to present Lori Larusso's fourth solo exhibition, Broken Plate, Full Heart, which features both Larusso's shaped and square paneled paintings. The Opening Reception for this exhibition is on Friday, July 31 from 7-10pm. Come for an informal Meet the Artist event on Saturday August 1 at 2:30pm. Broken Plate, Full Heart in our West Gallery also coincides with Kellee Wynne Conrad's solo exhibition in our Front Gallery. My current work explores the unavoidable contradictions that exist in our personal (and collective) systems of belief, by pointing to the complexity of our individual situations and the structures that trap us when we try to alter those beliefs. While based in the experience of daily interaction with our immediate surroundings, these pieces examine looming traditional and cultural expectations that resist forces of change while also promising something better. My interest in representations of domestic spaces lies in the comfort that is implied, and that how this notion of comfort reduces the complexity that is present in the way these material forms were produced and came to occupy the domestic space. The domestic sphere is a private place, but we are constantly seeing curated snapshots of domestic life via facebook, instagram, mommy blogs, etc. This is no different than the 1950s depictions of women happily slaving away at domestic chores. These new blogs have replaced the old Better Homes and Gardens, Family Circle, and Woman's Day magazines. Our "retro" pasts have become some women's current reality. Our home lives are never that simple or neat, they cannot be summed up in an image of a freshly baked pie, images of toddlers in knitted sweaters and homemade haircuts, or even in a picture of a pile of dirty laundry and the mess that the new puppy made. These images only begin to present a version of what is really going on inside the home. The Afterparty series evolved out of a body of work that presents images of beautifully perfect, whole (uneaten) birthday cakes at the moment after the candles have been blown out but before the cake has been cut. While there is something occasionally tragic or ironic about representations of perfection, I believe the Afterparty paintings encompass something more. 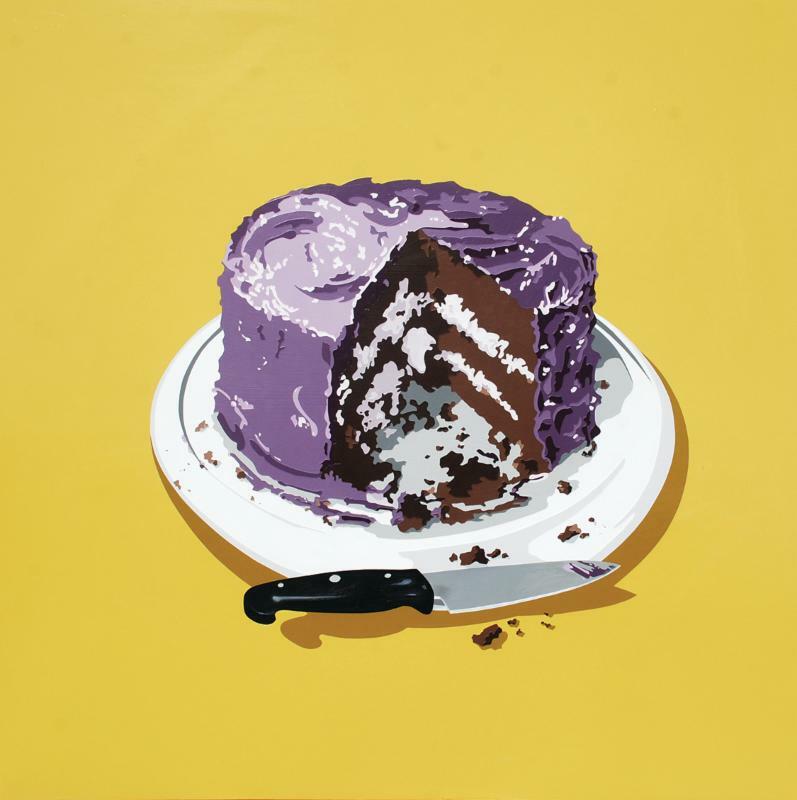 These works maintain a sliver of the perfection inherent in a whole, beautifully prepared cake while refusing the viewer an obvious image of perfection; rather these pieces suggest a more direct representation of a cake (as in, half-eaten; cakes are meant to be eaten) while they allude to notions of excess and post-party sentiment. These two separate yet connected bodies of work question, in part, the everyday search for meaning and fulfillment. 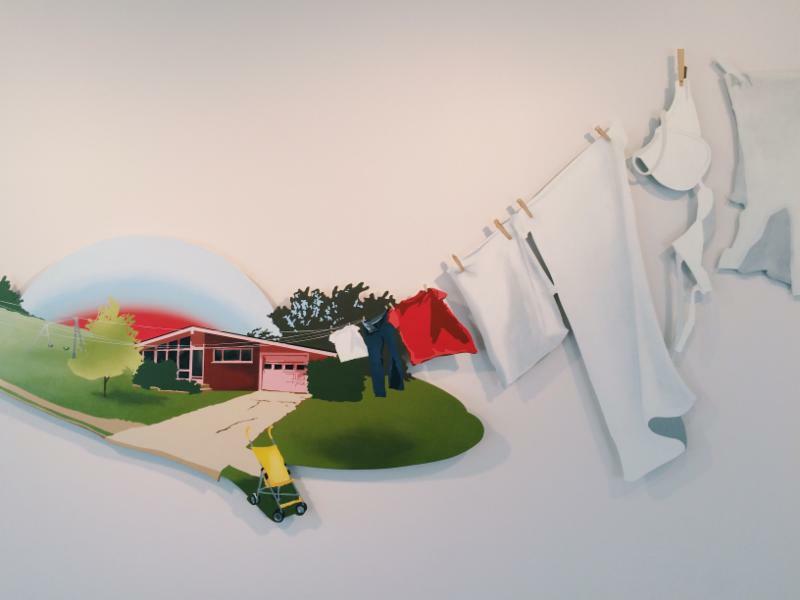 Representations of generic middle-America allude to the common feeling of disconnect, as well as the struggle for validation and happiness in daily life. READ more about Lori Larusso & RSVP to this Opening here! Thrive at Jordan Faye Contemporary is delighted to present Kellee Wynne Conrad's solo exhibition, pen*ti*men*to. Kellee Wynne Conrad is the first of our Thrive Artists to participate in our new Residency Program. Over the last 10 months we have had the pleasure of getting to know Kellee both personally and professionally -- it has been nurturing, insightful and a mutually beneficial experience for us both. The Opening Reception for pen*ti*men*to is on Friday, July 31 from 7-10pm in our Front Gallery and coincides with Lori Larusso's solo exhibition in our West Gallery. There will also be a 'Meet the Artist' event for Kellee on Saturday August 29 at 3:00pm. The work in this series was created during my first residency in Baltimore, Maryland. The experience of working and creating in Baltimore has had a profound impact on my art. I started the journey with one idea of who I was in relationship to my environment, the people in my life and what creating meant to me, only to discover that I still know very little. Baltimore is filled with old buildings that once lived through a glorious era and people with stories who have been throughhard times, all revealing layers of things I had not seen or noticed prior to my residency. Previously, I would have sat back and watched the unrest from a safe suburban distance, but now I have met the people who live and work in this city and they have shared layers deeper than I ever imagined. While opening myself up to this new experience, I have gone through a transformation in my own heart and mind about what it means to be an artist, a mother, a wife and a woman. This process of discovery has transferred directly into my art as I have worked to build and reveal layers of paint and mixed media. For each piece I start by creating layers of paint and gesso on canvas or paper, often times allowing the paint to run off the surface. Sometimes I experiment by scrubbing or scratching to reveal the layers that came before. Often I am working quickly, making lines in the paint with pencils, the back end of a paintbrush or using spray paint to create a resist that will show through to the next layer of color. Creating this series came down to adding elements, taking parts away, making marks and building ideas only to obscure them with another layer of paint; it's a back and forth of deciding what needs to rise to the surface and what should be pushed back or hidden under the next coat of paint. Like the city, you must explore beyond the surface of the many layers and only then will the whole story be revealed. READ more about Kellee Wynne Conrad & RSVP to this Opening here! 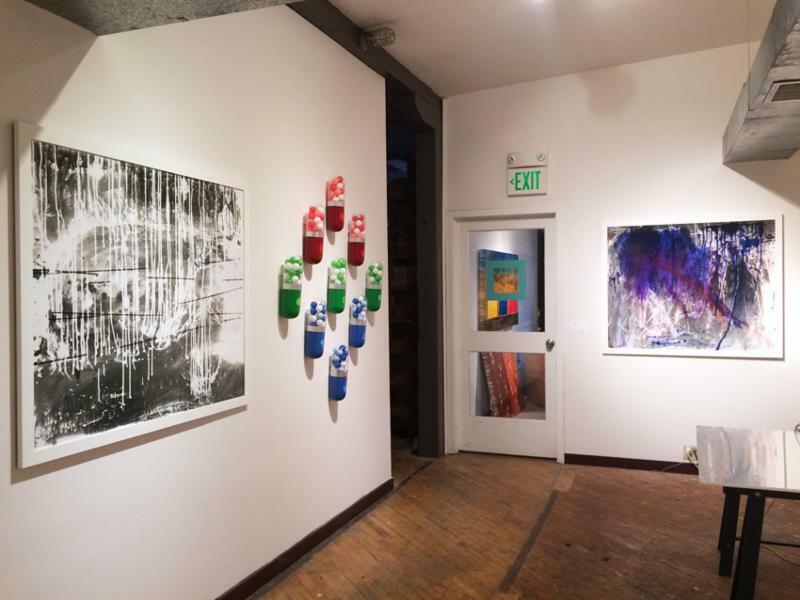 Jordan Faye Contemporary has continued to redefine the role of the gallery, creating exhibitions to meet the specific needs of artists and art enthusiasts in Baltimore. Founded in 2006 as a platform to give emerging artists a wider audience, we champion the work of early to mid-career artists. Through our gallery exhibitions, auxillary spaces, Thrive and presenting works at international art fairs, Jordan Faye Contemporary exposes a larger community to the engaging work of dozens of artists. Currently the gallery represents fifteen artists, who are now at various stages in their careers. Our mission is to show work that is not only of contemporary interest but will be of lasting historical significance. Thrive at Jordan Faye Contemporary is an incubator for emerging artists and curators; both in its ability to create a community of artists that is thought provoking, insightful and one that is created to share the wealth and knowledge of our collective experiences with one another. Thrive is dedicated to enriching the lives of artists and the community in which it resides. To achieve our mission we provide consulting, workshops and extended residency experiences. For individual artists we provide short exhibition opportunities designed to help navigate and thrive in today's art world. For curators and arts organizations we provide exhibition space to assist them in reaching a further audience and mentoring them in the curatorial process. This new organization is part of Jordan Faye Contemporary expanding their programming and relocating into a 3300 sq. ft. space in the Bromo Arts & Entertainment District at the Maryland Art Place Building Top floor of 218 W Saratoga Street. ARE YOU AN ARTIST THAT WANTS TO THRIVE? SIGN UP HERE TO RECIEVE THRIVE ANNOUNCEMENTS & OPPORTUNITIES.